Marmite & salami chonchiglie. Source: DWD. Some dishes don’t need a lot said about them, and this is one of them! It’s quick, simple, light and delicious. For me, the marmite is what brings all of the elements of the dish together, but it can easily be omitted. If you do remove the Marmite, add another 2 cloves of garlic and a little extra salt when seasoning. Method: Pre-heat your oven to 150c/130c fan/gas mark 2. Wrap the garlic in a layer of tin foil and gently roast for roughly 25 minutes, until very soft and the inside of the garlic clove has baked down to a paste. After the garlic has been roasting for 15 minutes, spread the salami on a lined baking tray and add it to the oven with the garlic until crispy, about 10 minutes. When crisp, tear into quarters. Bring a pan of water, with plenty of salt in, to the boil. Add the dried pasta to the water and cook as advised on the label. 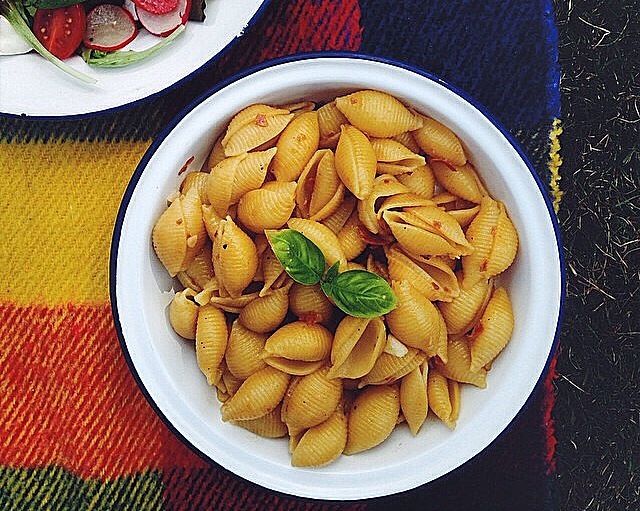 When cooked, drain the pasta, reserving ½ cup of the cooking water. Put the pasta, cooking water and large knob of butter back into the pan and mix well over a low heat. Add the marmite, garlic cloves (skins removed) and salami quarters to the pan and stir well until everything is heated through. Add a pinch of ground black pepper to taste and serve while hot. Shred the basil and scatter over the top to finish. 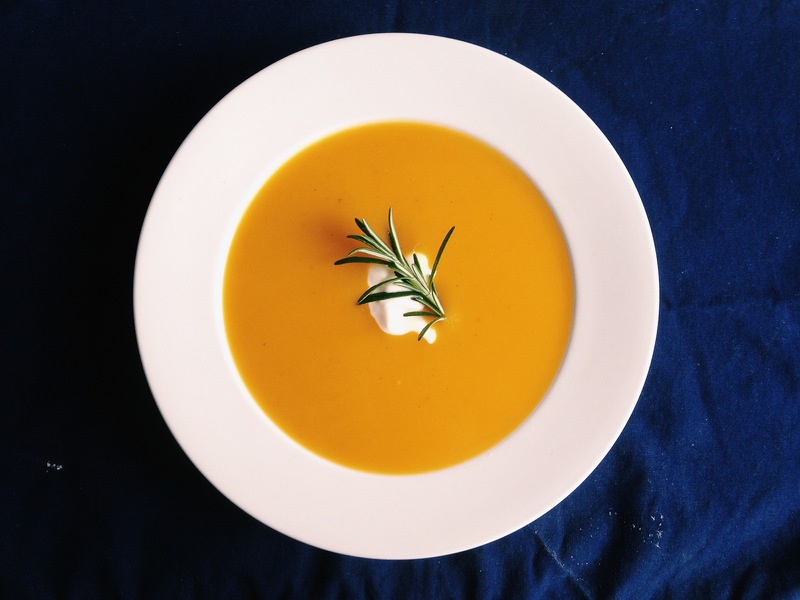 Spiced squash & apple soup. Source: DWD. As a student, I know how easy it is to buy your soup from your closest Every Little Helps store. It takes no time at all, costs very little money and most importantly – there is next to no washing up. For the same amount of time and washing up, you can create a soup that is marginally more expensive, but is unbelievably delicious. Not only that, but it freezes very well, so one large batch can sort your lunches for a week and cost as little as 60p per portion. Luckily, I had a jar of chilli jam kicking around, but in this recipe, you can substitute the jam for one extra apple and a teaspoon of dried chilli flakes. Serve with a little crème fraiche to offset the heat. Method: Add the oil to a large, heavy based pan on a medium-high heat. When the oil is hot, add the squash, onion, apple and garam masala. Stir so that everything has an even covering of oil and spice and cook for 4 minutes, or until the apple, onion and squash has gently coloured. Add the vegetable stock, fennel seeds and chilli jam and stir until incorporated well. Bring the pan to the boil, and then simmer for 15 minutes, or until the squash is soft. Take the pan off the heat and blend well with a stick blender, ensuring there are no large chunks of squash or apple. Season to taste. Serve while hot or freeze for up to 3 months. 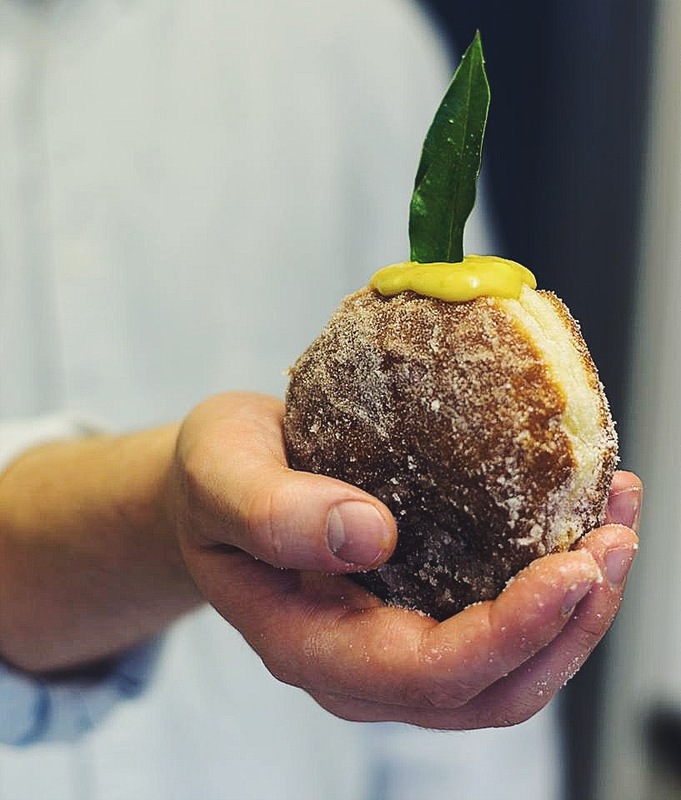 Clementine curd doughnut at HH Bakery. Source: DWD. As December approaches, we enter the height of clementine season. The smell of this amber fruit immediately sends me back to countless Christmas mornings, rummaging amongst chocolate coins and christmas parcels to the bottom of my stocking where I could find a clementine or two. Here I use clementines to make a delicious curd, which is both sharp and sweet in equal measure. It is hugely versatile and can be used in place of any recipe that calls for lemon curd, for a festive alternative. I pipe the curd into doughnuts, until they are fit to burst (around 40g of curd per large doughnut). Method: Set up an bain marie by heating a large pan of water to a gentle boil. Add a heat-proof bowl over the pan but ensure the water is not in contact with the bottom of the bowl. Zest and juice all of the fruit and add it to bowl, along with the yolks, eggs and sugar and mix to combine. Add the butter and stir constantly, so as not to scramble the eggs. Cook until the curd is thick, and coats the back of a spoon at least. Either add to sterilised jars as a beautiful Christmas gift or keep, refrigerated, until needed. The curd will keep for up to two weeks. This recipe is an adaptation of George Socratous’ for Jamie Magazine.